At first glance it looks like a very strange sculpture of a person in a rather odd position. 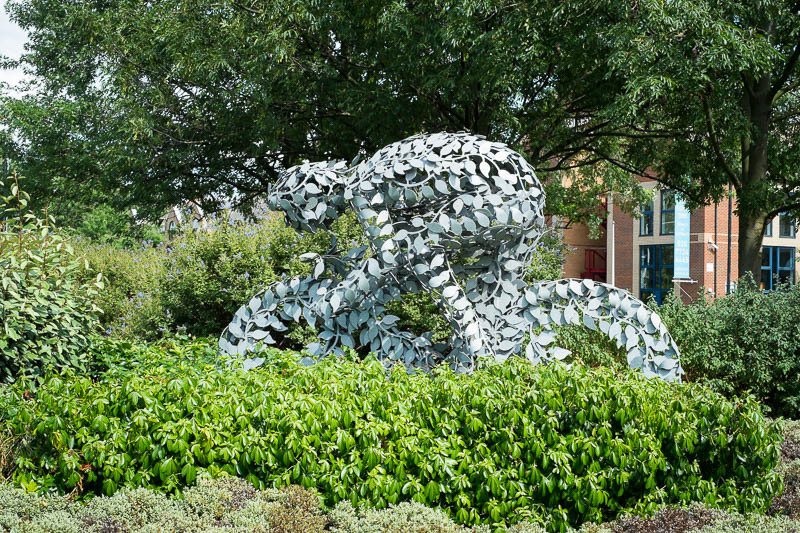 However on closer inspection and peering over the greenery, it is a man on a bicycle. A little research and I discovered it was a sculpture made to coincide with the 2007 Tour de France. The greenery around the sculpture has grown a lot in the past eight years. Where? On the roundabout at the entrance to the Rotherhithe Tunnel. It fits in to its environment perfectly, especially now all the leaves have grown around it! Interesting artistic image with the man and the bicycle made of leaves. It certainly does look like a bicyclist, and while it does stand out, it doesn't distract from its surroundings. That's very clever, I like that a lot..
What a unique AND nice find! An amazing piece of art that nature seems to have embraced. It is a fine sculpture. It fits in wonderfully with the environment.